Macy's signature larger-than-life helium character Balloons will proudly take flight in the skies high above New York City. The first parade appeared in 1927. Every year thousands of New Yorkers attend the parade and the amazing inflation process the night before. 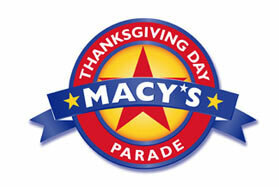 The parade starts at 77th Street and Central Park West, and ends at Macy's, 34th Street and 6th Ave. Viewing is restricted access from 36th to 38th Street on Broadway and on 34th Street from Broadway to 7th Avenue on the north side of the street. THERE ARE NO TICKETS SOLD; the grandstand seats are for special guests of Macy's only. The earlier you arrive, the better your chances of getting a good view. If you have kids, bring a blanket so that they can sit on the curb for a great view. Get a hotel room on route and order room service. Near the American Museum of Natural History at 77th Street and Central Park West. Traditionally an evening event, "Balloon Inflation," the coming to life of Macy's giant helium Balloons, will now be open in the afternoon for more family fun! Want a Parade View Room call us? Don't just get an ordinary room elsewhere and not able to see the balloons from your room!! 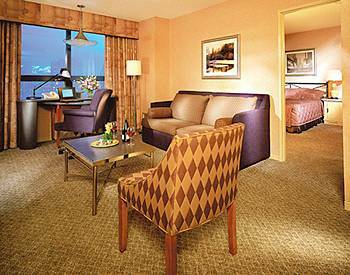 Parade View Room Rates $749 - $1,999 per room per night for Thanksgiving eve. After that night, rates go back to the regular rates $599 - $699. There is a three nights minimum for the Parade View Room (one night possible for Non-Parade View Room). Please book early. Parade View Room is non-cancelable and non-refundable. Upon booking we will provide you a hotel confirmation specifying Parade View category.